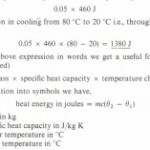 The specific heat capacity of a substance is defined as the heat required to raise the temperature of unit mass of it through 1K (Symbol used = c.) It follows that the unit of specific heat capacity in the SI system is the joule per kilogram kelvin (Jjkg K). In the following table it will be seen that water has the unusually high specific heat capacity of 4200 J/kg K. Very few substances have a higher value than this, the most notable being hydrogen at constant volume, and mixtures of certain alcohols with water. Incidentally, the high specific heat capacity of hydrogen, coupled with its high thermal conductivity renders it a very efficient cooling gas for enclosed electric generators.